To help businesses understand how consumers in East & West Malaysia shop online, iPrice Group recently conducted a research to understand them better and summarised their findings as follows. Unified with Sabah & Sarawak since 1963, Malaysia is a combination of two distinct geographical regions known as Peninsular Malaysia (West Malaysia) and East Malaysia. As the nation celebrates its 54th unification anniversary in 2017, its diverse cultures and people groups remains a special fact of its national identity. 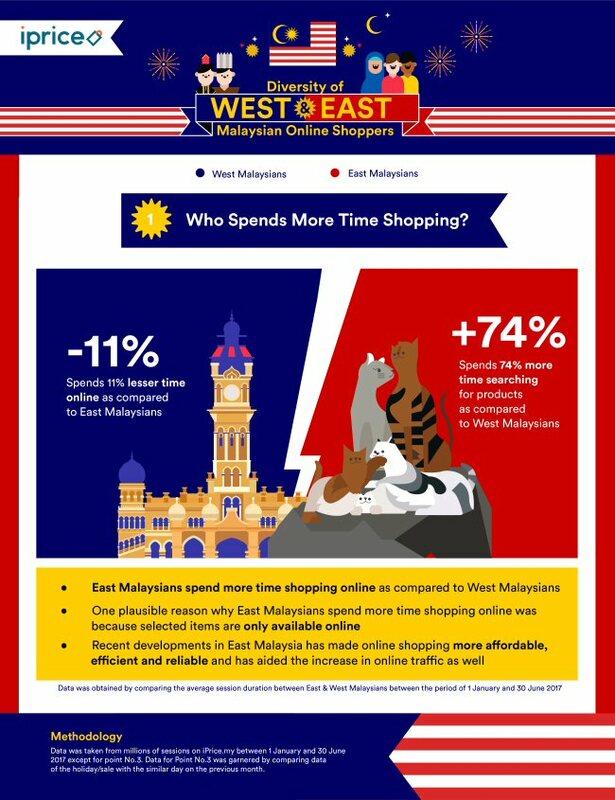 While many are aware of its racial and cultural differences, what about the way West and East Malaysians shop online? The e-commerce sector in Malaysia is estimated to become a RM24.5 billion industry by end-2017 and is expected to contribute more than 20% to the nation's gross domestic product (GDP) by 2020. Spearheading the full potential of e-commerce would be small and medium enterprises' (SMEs) which comprises 97% of businesses which has yet to make available their products and services across East & West Malaysia. 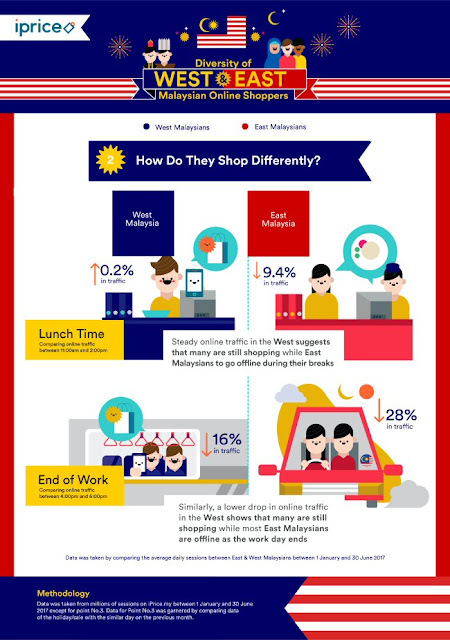 To help businesses understand how consumers in East & West Malaysia shop online, iPrice Group recently conducted a research to understand them better and summarised their findings as follows. Interestingly, East Malaysians spends 75% more time searching for products as compared to users in the Peninsular. Although there are more online shoppers in the Peninsular, they spend 11% lesser time shopping online. This confirms a survey conducted by 11street earlier this year that East Malaysians were more likely to purchase items online than those in the Peninsular. Online shopping has become more convenient and attractive in East Malaysia such as significant improvements in logistics and payment gateways. 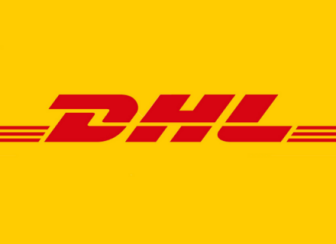 One such example is major logistics players such as DHL and MAS Kargo who both announced further development in delivery services to East Malaysia to cater the growing e-commerce demand in the East. Additionally, e-commerce makes it possible for East Malaysians to obtain products which was once not attainable in the eastern region. 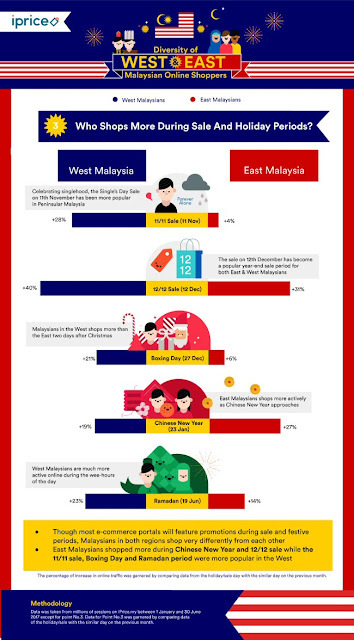 Analysing the way Malaysians shop daily, we found that both regions begin shopping online from 11am onwards. However, as the day proceeds, we saw that West Malaysians continue to shop during their lunch-breaks while most East Malaysians prefer to go offline. This is apparent as online traffic in the Peninsular slightly increases 0.2% from 11:00am through 2:00pm while there was a 9.4% decrease in East Malaysia in the same period. After lunch time, online traffic would rise and see a decrease once again from 4:00pm to 6:00pm. Although there was a drop in online traffic for both regions, there was a larger drop in East Malaysia as much as 28% while the Peninsular only experienced a 16% drop. With more mobile online shoppers in the Peninsular, this data suggests that West Malaysians are more likely to continue to shop via mobile as they commute home as compared to Malaysians in Sabah and Sarawak. West vs East Malaysia: Who shops more during sale and holiday periods? With various cultural and religious celebrations across the year, it is conventional to see various businesses conducting promotions activities in conjunction with selected occasions. Popular festivals or holidays which attracted many online shoppers were Ramadan, Chinese New Year and Boxing Day (two days after Christmas). For Ramadan, there was significantly higher increase in online traffic for the Peninsular with an increase of 23% as compared to East Malaysia with a 14% increase. Online traffic reached its peak on 19 June, just five days before the major Hari Raya celebrations. Interestingly, this period saw a rise with online traffic particularly at 4:00am onwards while they have their pre-fasting meals also known as 'sahur'. This was unique as online traffic would return to usual after the end of the Ramadan period. Particularly, there a larger increase of online shoppers in East Malaysia during the Chinese New Year period. Reaching its peak traffic just 5 days before Chinese New Year, there was a 27% increase in online traffic in the East as compared to 19% in the Peninsular. This was probably influenced by a large group of ethnic Chinese Malaysians in Sarawak, which comprised more than 26% of the population of Sarawak, a prominent state in East Malaysia. Unexpectedly, there was higher increase of online traffic in Peninsular Malaysia than East Malaysia during Christmas. This was interesting statistics showed that there were a larger number of Christians in East Malaysia as compared to the Peninsular. Online traffic reached its peak two days after Christmas on Boxing Day (27 December 2016) and there was a 21% increase in the Peninsular and just a mere 6% increase in East Malaysia. This data suggests that most East Malaysians prefers to celebrate the special occasion offline while West Malaysians continued to shop. The rise of interest in e-commerce has also made 'digital sale' periods such as the 12/12 sale a popular event to both East & West Malaysians. In fact, the 12/12 sale garnered the highest increase in online traffic when compared to other festive and sale periods, making it the most popular period when compared to others. However, the 11/11 sale was only popular in the West and did not garner much attention in the East. 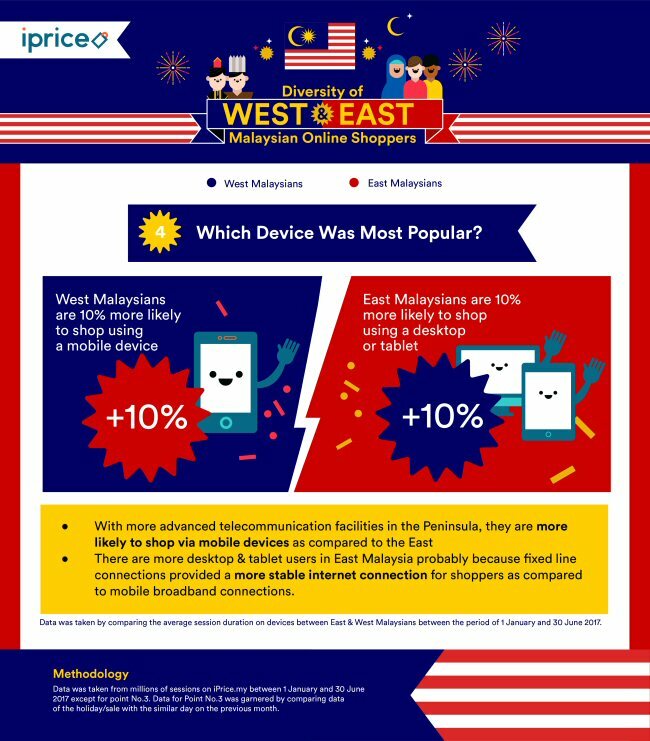 Malaysians in the Peninsular are 10% more likely shop online using a smartphone while East Malaysians are 10% more likely to use a desktop or tablet. Telecommunications infrastructure is far more advanced in in the Peninsular as compared to the East. As such, East Malaysians prefers to shop online using desktops and tablets as fixed line internet connections as compared to broadband. Considering the demographics of online shoppers, there were more female online shoppers in both regions as compared to males. Similarly, online shopping was most popular among Generation X and Millennials between the ages of 25-34 and 18-24.